John Tyrrell Blogs | John Tyrrell blogs from Birmingham, England about local, national and international issues. 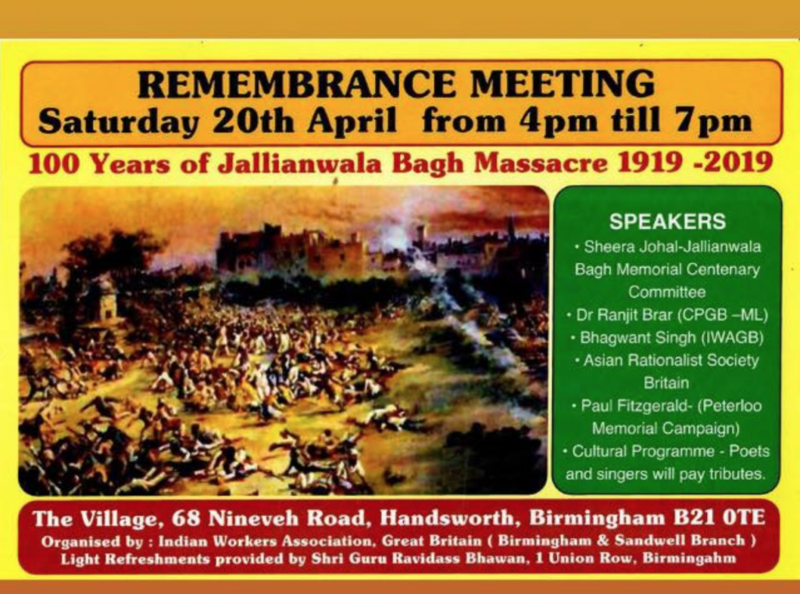 It is one hundred years since British troops opened fire on defenceless people including women, children and men in the area of the Punjabi city of Amritsar known as Jallianwalla Bagh. It was an enclosed public space where people regularly assembled for meetings or spent leisure time. There were high walls and very narrow alleyways. Gates were locked at the time, and many died escaping the bullets by jumping into a well. This notorious massacre has gone down in history and on the centenary of the event many are lobbying parliament for an official apology of what took place. Just two hundred years ago people had gathered in such a space in and area of Manchester. As in India armed militia were brought in and an order given to open fire directly into the crowd. This too has gone down in history as the Peterloo Massacre. 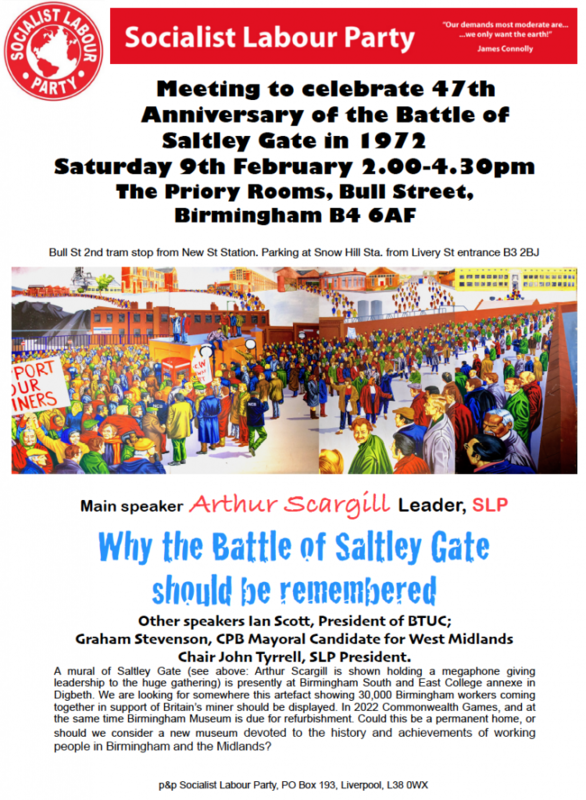 A meeting held in Handsworth Birmingham on Saturday, 20th April 2019, remembered both events and attention was drawn to how people have been, and continue to be oppressed by a ruling elite using armed militia. They unite people of India and the UK by the brutality they experienced at the hands of the ruling class in a shared history. The film Gandhi (1983) recreates events at Jallianwalabagh on April 13th, 1919. A film about Peterloo was released in 2012. An illustrated book about the event is due out to coincide with the bicentenary of the Peterloo massacre in August 1819. Both events should be included in schools’ curriculum. This entry was posted in Asia, International, National, Politics on April 22, 2019 by John. Growing up in the fifties and sixties I listened to a lot of music, becoming hooked on the classics. I spent time working in a gramophone record library in my home town of Enfield, alongside Eric Cooper who became quite well known in this innovatory field. We lent out vinyl lps and spent time inspecting borrowers’ stylus tips and the records themselves, recording scratch marks on disks printed on card, just as if hiring a car. Among the celebrities recording Beethoven, Mozart, Brahms were the likes of Toscanini and Bruno Walter, perhaps the established classic sets of that time. Karajan and Klemperer are coming into view, both with the celebrated Philharmonia Orchestra. Guido Cantelli became a firm favourite, although I didn’t attend any of his concerts. I still enjoy the recordings of Debussy, Ravel and de Falla. I began visiting the famous HMV store in Oxford Street, in London’s West End, and acquired mono recordings of the Italian and Unfinished symphonies of Mendelssohn and Schubert. Also a couple of 10″ disks of Brahm’s Third and Schumann’s Fourth. I still have these on CD and download. I began going to concerts, particularly at the Royal Festival Hall, in 1955/6. The conductors for some reason all seemed to have names beginning with “K”. First there was Karajan in a Mozart concert with pianist Clara Haskil, and then Beethoven under Klemperer. Others I was to encounter were Josef Krips, Royalton Kisch, Rafael Kubelik and Rudolf Kempe. I missed out on Keilberth and Knappertsbusch, but there were always recordings in the library! Oh yes there was a young Charles Mackerras. Does that count?! I think it was Harry Newstone who broke the mould. I have kept all these concert programmes. What do I do with them now? Klemperer in particular became noted for slow speeds. His lumbering presence, after suffering strokes and brain tumours, was reflected in his music making. Not least this was so in Brahms, but I heard a riveting account of Brahms First Symphony, particularly in the granite like conclusion. This is evident on his recording with the Philharmonia. I later found the performance of the Brahms First Symphony is also swift in the first movement when I started catching up with reissues. I was brought up at a time when slow or deliberate tempi were the norm, but lived to witness a time when authenticity has become the order of the day. When it comes to Brahms a clutch of recordings from chamber ensembles have appeared, comparable to the size of the Meiningen Orchestra which Brahms knew and first performed some of his works. A set came out from the Leipzig Gerwandhaus Orchestra under Riccardo Chailly. This referred back to a set made by the London Symphony and Philharmonic Orchestras in 1939/40 under Felix Weingartner. I find these performances more compelling than many of the new recordings I’ve heard. Music performance is created from momentary feelings and ideas as much as anything and spontaneity is crucial. This seems evident in the Weingartner recordings. Other recordings from the thirties shows much quicker tempi, and these were from people who either knew Brahms, as Weingartner did or were closely linked. Recordings of the two Piano Concerti from Backhaus and Schnabel are considerably faster than performances even now. A recording of the Tragic Overture by Bruno Walter and the New York Philharmonic Symphony Orchestra is also exciting and revealing making you feel this is the way it should go. Subsequent recordings with the Columbia Symphony Orchestra don’t catch this mood. Carlo Maria Giulini visited Birmingham Symphony Hall with the Philharmonia with Hugh Bean leading. Both have since left us. Brahms Second Symphony was four slow movements and for me painful to sit through. I thought I was used to Klemperer performances, but they certainly didn’t have the same effect. Looking back at recordings from fifties I found that there were performances among my vinyl collection which were swift in contrast to the prevailing slowing down of the classics favoured by so many of the star conductors. I discovered, or rediscovered that Cantelli’s performance of the Schubert Unfinished Symphony’s first movement was a real allegro. I haven’t heard many performances like this, an exception being Thomas Dausgaard with the Swedish Chamber Orchestra which is, well, fast! Cantelli’s is a performance I want to return to. Klemperer’s Beethoven became legendary, but the issuing of Roger Norrington’s Beethoven recordings I found a revelation, particularly with Symphonies Two and Eight which I had on cassette. I found Harnoncourt fine, but the performances I enjoy above all came from an unexpected source: Emmanuel Krivine with the Chambre Philharmonique which really points up a link between these works and dance or folk traditions that existed, on which Beethoven must have drawn. They can all be seen on Youtube. Similarly Mozart Symphonies from Jos van Immerseel and Musica Aeterna, Bruges are exhilerating. This entry was posted in Music on April 14, 2019 by John. Brexit rides rough shod over political identities, Tory or Labour, left or right, brexiteers or remainers. The booted and suited remainers could well be Labour, we know that it is the Tory elite group who are leading the Brexit campaign since this is the message repeated ad nauseam in press reports. The left case is less well documented. Brexit has been identified with the right from the start with UKIP getting full press coverage. Takis Fotopoulos analyses a situation where, not only in Britain, but elsewhere, including the US, confusion has abounded. The population, divided between the beneficiaries of globalisation and those (the majority) who have found themselves its victims, have looked for alternatives. The traditional left has failed to show support for the victims while many are giving support for remaining in the European Union, an engine of globalisation repressing further those affected by austerity, the loss of what were termed “essential services” provided by almost non-existent local government. In case any one missed it, this was David Cameron’s promise around the time he offered the chance to take part in a referendum on staying in or leaving the EU. Since then local government has shrunk losing the ability to provide even the most essential of services at the same time as increasing council tax levels significantly. Privatisation of everything, following the highly praised model of Chile’s experiment under Pinochet, has taken hard as “globalisation” (neoliberalism) has taken firm hold. It has become the engine of the European Union and its institutions as well as governments universally whether calling themselves right or left. Every where privatisation has been practiced flagship projects have ended in tears as private providers collapse through corruption and greed. Carillion failed in the middle of building new hospitals, our railways are costing more and more, at the same time as failing to deliver basic services with huge profits going to providers which include companies set up by state railways of Germany, France, Netherlands, Italy etc. Carillion’s highly paid boss not only landed a new job leading another failing company but was retained as a government adviser. Heads they win, tails we lose. This entry was posted in National, Politics on March 25, 2019 by John. This entry was posted in National, Politics on January 20, 2019 by John. The Labour Party MPs and the Labour Party leaders who voted yesterday to oppose a “NO DEAL” are guilty of betraying the British people and betraying comrades such as Tony Benn and Michael Foot who warned that membership of the EEC and later the. European Union would destroy our economy and hand over our sovereignty to an unelected body who take decisions and adopt laws which are binding on all member states, and more important membership would bind Britain to a EU which has a constitution which commits all member states to a Capitalist system. I congratulate Ronnie Campbell ( a mining MP ) Graham Stringer and Kate Hoey who were the only three to keep the faith. The Labour Party leadership should lead the fight for a ( NO DEAL) exit from this rotten bureaucratic E U.
Arthur Scargill leader Socialist Labour Party and former President of the National of Mineworkers. This entry was posted in National, Politics on January 10, 2019 by John. Jeremy Corbyn’s embrace of a Customs Union is a sell out to Labour Party’s Right wing EU fanatics Keir Starmer and Chuka Umunna and it means that the Labour Party is now committed to, Free Movement of Workers from 27 EU Countries in to the U K, a Single Market which allows Companies to move out of the U.K. to other EU States where workers are paid lower wages, The EU’s constitution is committed to Capitalism and membership or collaboration with the EU means Britain has to accept the tariffs ( Import Controls ) stipulated by an unelected body in Brussels. Arthur Scargill. Leader Socialist Labour Party. This entry was posted in National, Politics, Uncategorized on September 26, 2018 by John. This entry was posted in National, Politics on September 24, 2018 by John. The statement by the Labour Party Leadership that they would support a second referendum is an act of treachery for which they will never be forgiven. The ruling class have used and will continue to use every means including a media which has sought to overturn to overturn the decision of the British people in the 2016 Referendum. Tony Benn warned that membership of the European Union would mean that Britain would governed by a Constitution which is committed to Capitalism. The ruling class and the EU will demand another referendum and another until they get the result they want. As a socialist I call for all those who call themselves socialists to condemn this act of treachery by the Labour Party Leaders and campaign for withdrawal from this bastion of Capitalism. Arthur Scargill, Leader Socialist Labour Party. This entry was posted in National, Politics, Uncategorized on September 23, 2018 by John.